Italy holds so many charms in her bosom, that it may get a little bit overwhelming when you plan your visit to the bel paese. Art, history, architecture, nature, spas… Where do you start? Especially if you have only a handful of days to see it all. It is not surprising then that most people opt to spend their time in larger cities the praises of which have been sung over and over again by countless travel books, travel documentaries and, lately, travelogues. Yet, the main attraction of Italy is the ability to step off the beaten track and, without having to compete for space with thousands of other tourists, have an authentic experience which is the stuff memories are made of. All you have to do is to be a little bit brave, refuse to follow the crowd and include in your Italian adventure at least one place which the locals like to keep for themselves. So, today I would like to recap the six reasons which should bring you to Vicenza as soon as you can. Located almost in the middle between Venice and Verona in the verdant Northern Italian region of Veneto, this charming Italian city is a great place to stop off for a day. 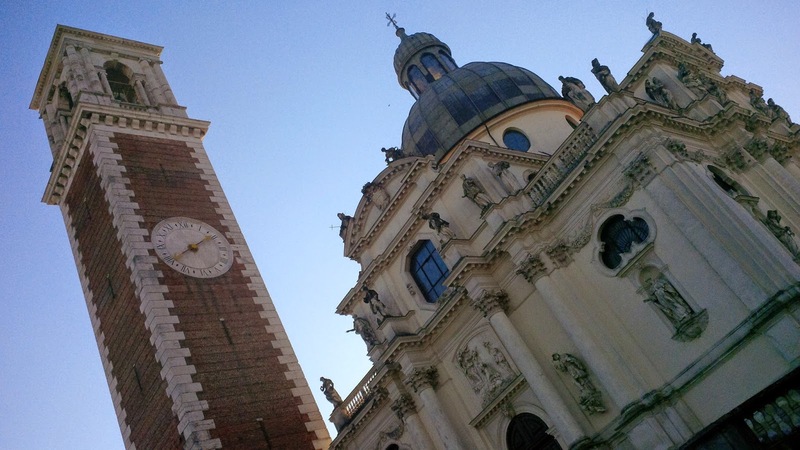 You can take an early fast train out of Venice’s Santa Lucia station and in 45 minutes you will be arriving at your destination. Then in the evening 25 minutes on the fast train is all it takes for you to reach Verona from Vicenza. On the surface of it, it should be difficult for this Italian city to compete for attention with Verona’s Romeo and Juliet’s tradition and Venice’s all round gorgeousness. Yet, Vicenza has more than enough to hold her own. 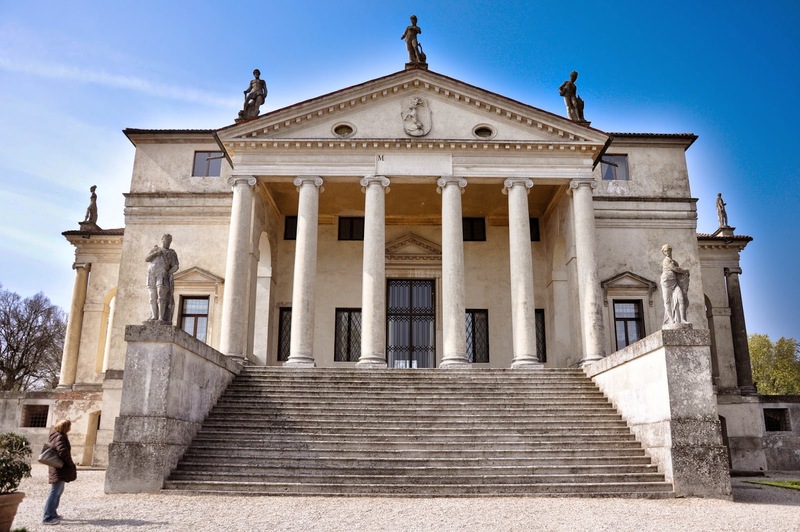 If you have ever wondered how the term ‘Palladian’ came to be, Vicenza holds all the answers. Spend the morning admiring the jewels in her crown – the Basilica Palladiana and the Loggia del Capitaniato on the main city’s square Piazza dei Signori, followed by Teatro Olimpico and Pallazo Chiericati (at Piazza Matteoti) and finish with a brisk walk to La Rotonda – allegedly the most symmetrical and most copied building in the Western civilization. All of them plus several other famous palaces in Vicenza were designed by Andrea Palladio – the most influential person in the history of Western architecture. Taking his inspiration from the ancient Roman and Greek architectural postulates, his work and mathematical ratios are widely studied and have served as a prototype for some of the most famous buildings in the world, among them the White House. 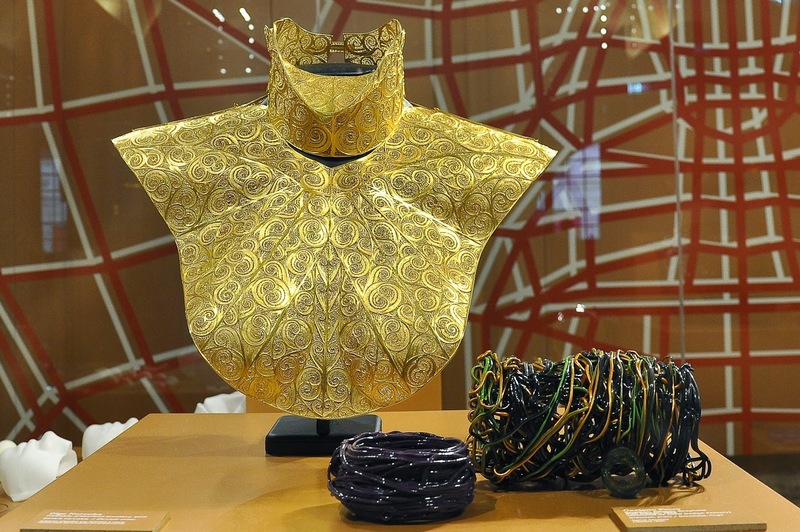 The first Museo del Gioiello in Italy opened its doors on Christmas Eve 2014 in Vicenza. It is housed in the Basilica Palladiana and its premises used to be a goldsmith’s studio as far back as the 13th century. The museum holds over 400 exquisite adornments arranged in nine rooms dedicated to the themes of Symbol, Magic, Function, Beauty, Fashion, Art, Design, Future and Icons. The exposition includes pieces made 24 centuries apart – from Etruscan gold and glass jewellery to ultra modern plastic and gold pieces. All possible trends in jewellery making in between are represented. My favourite room is Beauty with its stunning selection of necklaces able to make you feel like million dollars. The ticket for the museum is only 6 euros, so spend at least an hour admiring the different jewels on display there. The exposition will be changed every two years plus temporary jewellery exhibitions are also being organised, so this is the perfect excuse to keep going back. You may have never heard his name before, but Antonio Pigaffeta from Vicenza was the world’s first travel blogger. Born in a rich family of Vicenza, he circumnavigated the world from 1519 to 1522. He was Magellan’s assistant and served as a diarist on the historical first journey around the Earth. In the three years that the voyage lasted, he took countless notes, jotted down facts and observations and drew maps and sketches of the visited places, their geography, flora, fauna and their people. He even described Magellan’s death and was one of the only 18 people who completed the circumnavigation out of the 240 who had set out to make it happen. Upon his return to Italy Pigafetta published a book ‘Report on the First Voyage Around the World’ based on his diaries. 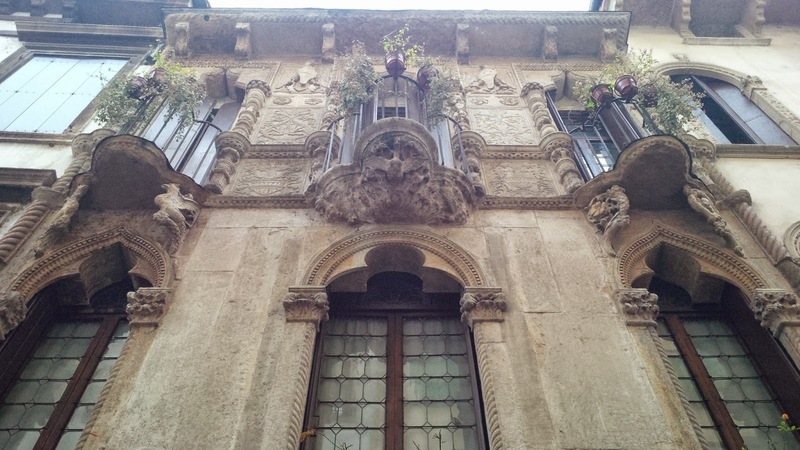 His house can still be seen in Vicenza. Its facade is staggering and on both sides of the front door there is a sign carved in the stone walls which states in French: ‘There is no rose without a thorn’. Vicenza can have this deceptively sleepy appearance, when in fact it plays host to many exciting events all through the year. 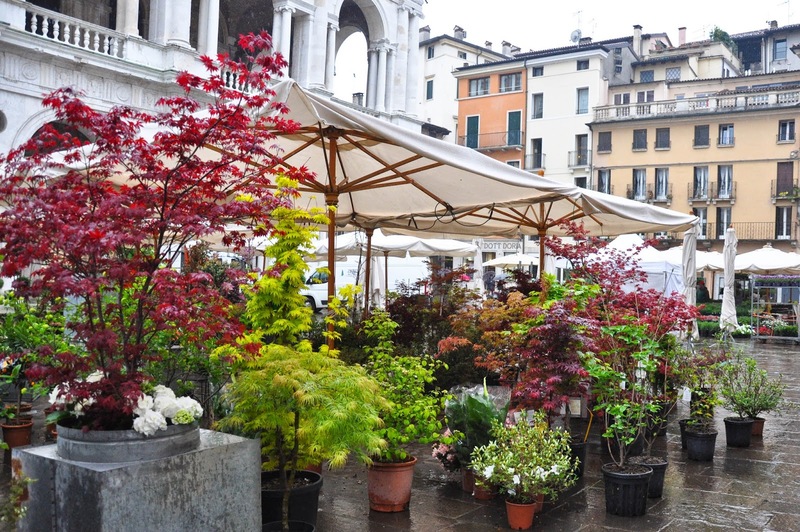 Just this past week-end a huge floriculture market show took over the main square Piazza dei Signori. Twice a week the market comes to town and turns the historical centre into a lively hub of merchandise and people. Once a month a huge antiques market spills down the main streets of Vicenza. Not to mention the myriad of concerts, theatre shows and exhibitions, the most important of which at the moment showcases originals by Caravaggio, Van Gogh, Titian, El Greco and many other world-renowned artists in Palladio’s Basilica. My favourite event in Vicenza so far was the living Nativity scene which I can only describe as my best Italian Christmas experience. If you are looking for a place to spend the hours of the afternoon siesta, head over to Parco Querini. It is the kind of wonderfully wacky place straight out of ‘Alice in Wonderland’. Not least because hordes of fluffy bunnies and proud roosters run free all through the park, accepting benevolently the huge amounts of food the citizens of Vicenza kindly bring them. The whole park teems with animal life – from ducks to some of the biggest turtles I have ever seen, from pigeons to nutrias. The latter, if you have never seen or heard of it, is a large hairy animal which looks just like an enormous rat. It swims really fast and has long front teeth and thin hairless tail. It looks much cuter than it sounds, so don’t be alarmed. Expect also to see lots of joggers and fitness aficionados practising on the equipment positioned in one of the corners of the park. 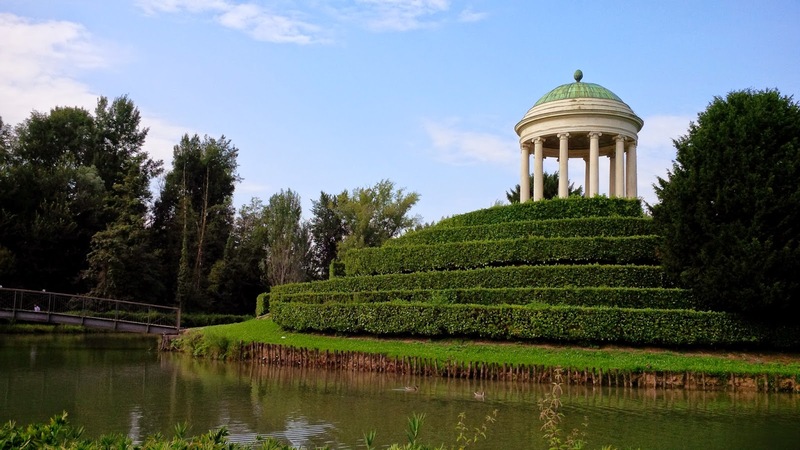 Before you wave good-bye to Vicenza, make sure that you set some time aside for a visit to Monte Berico. Going all the way up the hill requires some physical stamina (getting a taxi is always an option), but you will be rewarded with three fabulous experiences. The first one is the walk up the really long flight of stairs followed by the steeply inclined elegant arcade which goes up to the top of the hill. Once there, you can visit the church built after the Virgin Mary appeared on that spot twice almost six centuries ago. And the third experience is the amazing view which opens over the plains and the mountains of Veneto with Vicenza in all her splendour lying at the bottom of the hill. Enjoy your visit to Vicenza!